Teacher Residencies: Less Risk and More Reward? Prospective teachers have many choices when it comes to their preparation, and the right decision isn’t always obvious. Depending on state requirements, college undergraduate students have the option of entering a traditional Bachelor’s education program at an institution of higher education. College graduates or career changers can choose to enter a traditional Master’s program or a variety of alternative certification programs such as Teach For America or TNTP, all of which vary in student teaching requirements, cost and financial incentives, and support and mentorship opportunities. Increasingly, prospective teachers have yet another option at their fingertips, and one that holds promise: teacher residency programs. 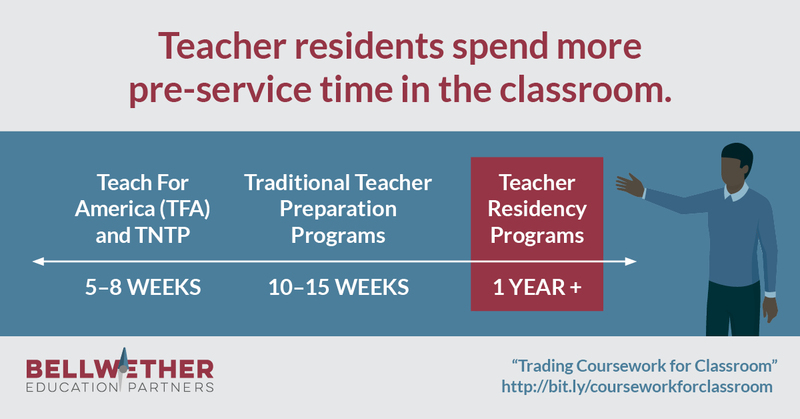 Residencies differ from other preparation programs as teacher residents spend the bulk of their training working in classrooms. In a report launched this week, Ashley LiBetti and I examine the appeals of residency programs and offer recommendations for addressing the policy and research gaps that inhibit the growth of these promising options. Teacher residency programs mitigate the risks associated with traditional preparation pathways. A 2016 Bellwether analysis found that teacher candidates spend $24,250 over 1,512 hours on average for traditional teacher training. Candidates invest significant time and money without truly knowing what life as a teacher looks like, since most traditional programs only require 10 to 15 weeks of in-classroom service requirements during the degree program. That’s a huge risk, particularly for career changers. Teacher residencies reduce that risk by being less expensive and exposing prospective teachers to the challenges and opportunities of teaching in a classroom right from the start. From as early as day one, residents are placed in a classroom with an experienced mentor teacher and are deeply integrated into the daily life of a teacher of record. Some programs even have an additional trial period before starting the residency year. Nashville Teacher Residency, for example, requires that incoming residents take part in summer sessions prior to the beginning of the school year. The trial periods act as auditions for both the program and the resident. This entry was posted in Teacher Effectiveness and tagged mentorship, Teacher Preparation, teacher residencies on July 19, 2018 by Justin Trinidad. Let’s be clear. There is nothing wrong with black and brown children. To illustrate the point, I often […] bring up Thich Nhat Hanh who wrote, “When you plant lettuce, if it does not grow well, you don’t blame the lettuce. You look into reasons it is not doing well. It may need fertilizer, or more water, or less sun. You never blame the lettuce.” However in education, we constantly blame children for disengagement. What about the schools? This entry was posted in Politics of Education and tagged Andre Perry, mentorship, The Hechinger Report on February 18, 2015 by Tanya Paperny.